Where is Amma?/Amma kahan hai? Kiran looks everywhere ? in the kitchen, in the balcony and even in the unlikeliest of places! Where is amma? 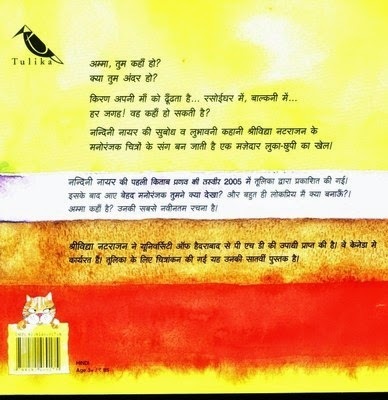 follows Nandini Nayar's whimsical What Did You See? and the very popular What Shall I Make? which has editions in the US and the UK and was cited by the Honour List of the United States board on Books for Young People (USBBY) in 2010. Srividya Natarajan's charming watercolour illustrations make this book one warm and irresistible hide-and-seek story.